To create all of these cards, I started with Stampin' Up! 's Blooms and Wishes which contains several small floral designs, leaves and a few greetings. This set is discontinued; however, any set with floral or other small designs would work. I used a few other stamps for greetings and one background stamp - the wood grain. 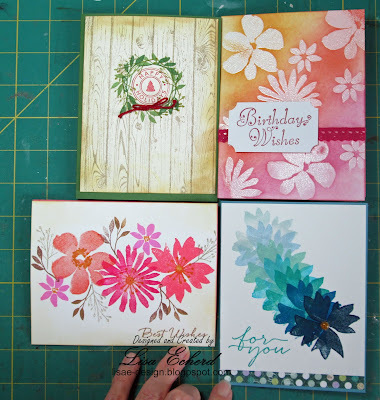 Those are so pretty Lisa .... love how you got so many different designs out of one stamp set! I think my favourite is the rainbow of blues! I'm going to give this idea a try - thanks! Oh, and the Christmas card you did first looked straight to me!